Not to add any more pressure to your already hectic day, but did you know that there are only 17 days until Christmas? EEEK! As most of you know, I'm a Mom to a 21-year son [EEEK again} who lives in another state. While we will be using the advent calendar we've used for years and years and years here at home for Isabella and Victoria, I began to wonder how I could send some advent calendar tradition through the mail for Zach as he is away from home during the holidays. Even though he's 11 and 13 years older than his sisters, when he was still at home, he did not want to be left out and eagerly waited for his privilege to open the advent calendar doors. Okay, so it's not a traditional advent calendar, but my hopes are that Zach and his girlfriend, Ruth, have as much fun and anticipation in looking forward to the days they get to open another little goodie bag as when he was younger. Let's take a look at some of the details where I've not only stamped on the canvas bags, I've also embellished them with layered stickers, decorative tape and faceted gemstones. I even used some of the decorative tape to form a pennant embellishment. 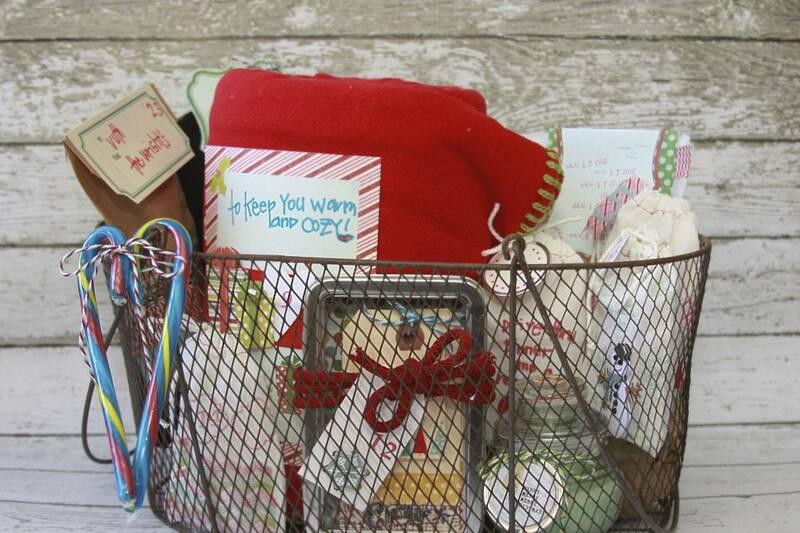 Who wouldn't adore receiving this gift tin full of already embellished gift tags and fun package of twine to wrap gifts? Zach won't be at all thrilled, but his girlfriend will!! Don't forget there are such cute tags included in the Winter Wonderland 4x6 Designer Accessory Pad. In addition to using more decorative tape to give some colorful flair to the kraft bag, I've added a tag as a bag topper and used another tag from the Pad, as well as some stamps, to decorate another gift tag for the toboggan. And how about using a whole sheet from the Pad as a tag and add a few layered stickers that coordinate with your chosen design to call it done. 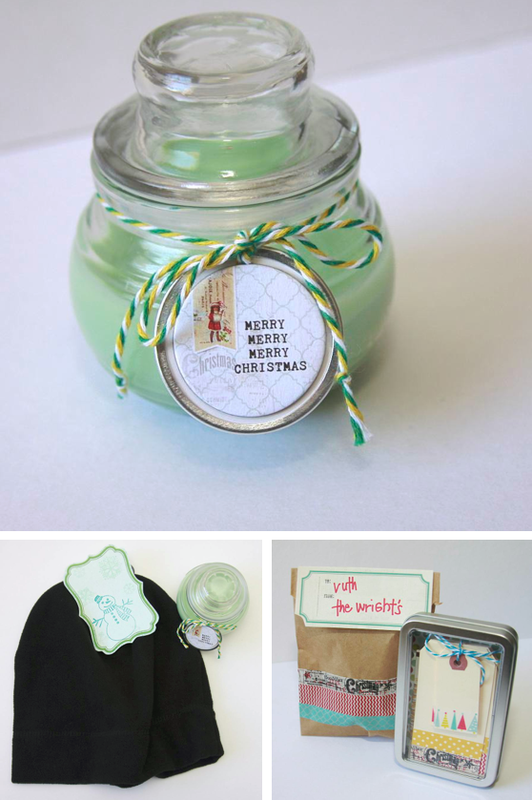 After adding a chipboard element to a metal-rimmed tag, tie a length of twine around the candle for mini-cuteness. Find links to all My Mind's Eye supplies I've used here. 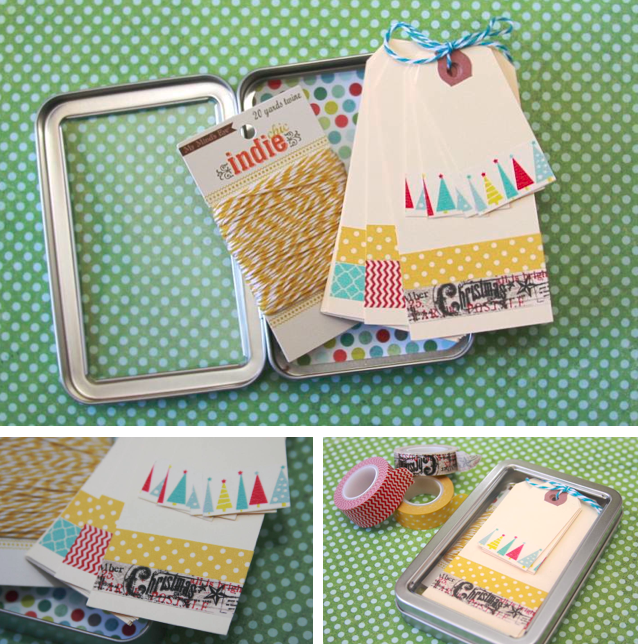 Find kraft bags, hinged metal tins, canvas bags, metal rimmed tags in the shop. Cute package! Zach and Ruth are going to love receiving that package. Hope it works out for Zach to be home for Christmas... That would be the best present!! What a cute thing. Zach and Ruth will love it. Am a lil bit older than Zach but my Mom filled my adventskalender every year again with some lil things inside. My hopes are getting to you and your family that he will be home for christmas.